No, it’s not a Mac or an iPhone accessory. It’s not even a camera gadget. 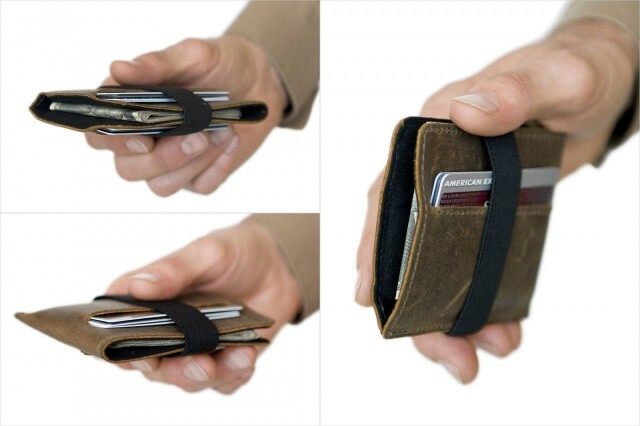 But I have no doubt you’re going to love the Victor Wallet from WaterField design. It’s thin, it has a soft, finger-loving lining and it comes with a strap to keep it shut. It’s clear that – like bags – no wallet is perfect. But what’s not so obvious is that most wallets are junk, and yet we buy them and stuff them full of crap we don’t need until they can’t do their job anymore. In some ways, wallets are a metaphor for our lives, which we fill with yet more junk shipped in via Amazon Prime until our homes resemble the Amazon warehouses themselves. Only without the underpaid workers milling around, or the robots that probably stride around the place, whipping lazy employees to make them work faster. So you can make a start at decluttering your life with the skinny Victor, with its Ultrasuede-lined cash compartment and two external card pockets. As ever with wallets from the U.S, this one has nowhere to put coins, but it does have an elastic strap to stop anything from falling out. Bonus: The wallet costs just $29. And if you embrace its minimal aesthetic and start to strip the cruft from the rest of your life, then you’ll have somewhere to keep all the extra money you have saved by not buying things. And ironically, this will mean you have too much money to fit in this skinny billfold. Isn’t life hard?